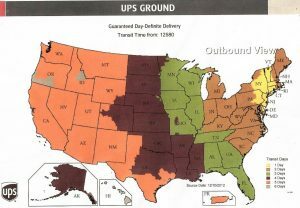 CurrantC is located in Staatsburg New York and all shipments originate here. We will do our very best to ship your order out within 2 days of ordering (most of the time we ship next day) EXCEPT for the following products. All frozen Currants will ship on Mondays to avoid getting stuck in transit and defrosting. Orders received on Monday will ship the following Monday. If, however, you need an order to be delivered by a certain date, please contact us at 1-800-CurrantC and we’ll do our best to get it to you on time. 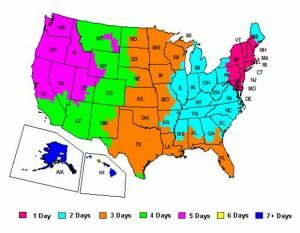 If you are ordering frozen currants and are located in one of the ABOVE states please choose UPS 3 Day Select or USPS Priority mail as a shipping option. Choosing ground shipping method will result in delay of your order and we cannot guarantee product condition. Frozen currants are shipped in Styrofoam lined boxes with enough dry ice to keep them cold during shipping. Please note that the dry ice dissipates and may have evaporated by the time you open your package. Each package shipped with dry ice will contain an instruction sheet on how to handle it if there is any left in your package. Some thawing is expected and if the currants have gotten soft they can easily and safely be refrozen upon delivery. Please Note: Shipping/Delivery times DO NOT include weekends. If delivery is necessary on a Saturday, please call to arrange shipment. Additional fees apply.